Judging from the media headlines, this is a volatile period in the stock market. We’ve all seen the news: Emerging markets are crashing! A global trade war is imminent! And rates are rising, despite President Trump’s disapproval. All of this makes for great headlines. It also comes across as vital information, driving market prices back and forth on a daily basis. At least, on the surface it looks like the market is making big moves. But, when you closely examine at the actual stock market reaction, we haven’t seen quite the same over-the-top price moves. Instead, the market is back to where it ended in 2017, making 2018 one of the sleepiest years in history. It’s the opposite of extreme volatility. We are currently in a period of very minimal price changes in the S&P 500 Index. 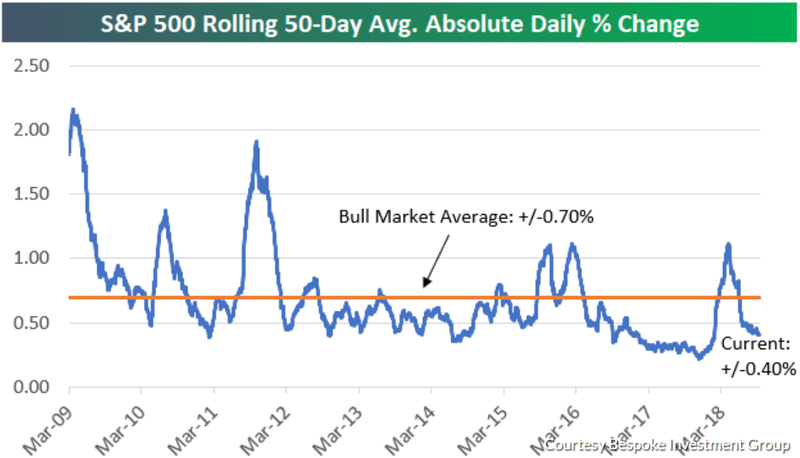 This chart shows the average daily price movement, over a 50-day period, for the S&P 500 Index. The current level, of plus or minus 0.4%, is well below a bull market average of plus or minus 0.7%. Clearly there is a disconnect between investor reactions and the headlines we are seeing. As investors become detached from reality, the market edges higher. It will take a large event to wake them up. Something more than just headlines. And the market has a few potential triggers waiting in the wings. Interest rates are on the rise and will eventually get to a point where they will slow down our economy. If the emerging market crisis boils over into more developed markets, we could see the broad market stumble. And when prices start to rise for the everyday consumer, we’ll know trade wars were an issue. At some point, one of these issues, or another issue that hasn’t even hit our radar yet, will become a reality. That’s when we can expect volatility to pick back up. The market is never dormant for long. Right now, it’s deciphering these fear-driven headlines and what’s having an immediate impact — which is exactly how we want the market to work. Just know volatility always comes back. And when it does, we’ll be there to help you navigate a volatile market to continue generating profits.